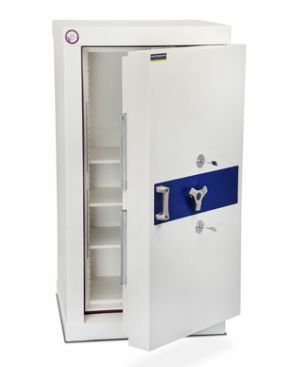 Burton Safes are a leading supplier of safes, vaults, vault doors, security doors, secure storage solutions and access control & locking systems. We are based near Huddersfield in the north of the UK, about 45 minutes from Manchester, Leeds and Sheffield. A privately owned business, Burton Safes was founded in 1990 by Norman and Hilary Berry, the former having previously spent several years with Radway Safes. At that time the company concentrated on wholesaling home safes to locksmiths and hardware stores in the UK and still to this day we value and cherish this customer base. However, over time our product range grew and so did the customer base. We now offer a huge range of secure storage solutions for home use, business use and government use. In 2000/2001 the current owners joined the business and in 2011 they purchased Burton Safes from the Berry family. Since 2012 the company has slowly been growing its export markets and today we have installations in mainland Europe and The Middle East, in addition to our traditional UK marketplace. In 2013/14 the company achieved a turnover of approximately €5,000,000 Euros or $7,000,000 USD and in May 2014 moved into brand new offices and warehouses occupying around 1000m2. At all points throughout our history we have placed a great deal of emphasis in offering high quality products and high quality after sales service. For our International markets in particular we concentrate in offering the very highest levels of security, quality and innovation, as we believe that this is where we can differentiate ourselves from others in the market. We are very good at creating bespoke, tailor made security solutions for our customers. If required we have a team of engineers and installers who will travel almost anywhere in the world to assist our customers and we pride ourselves in ensuring that each project is finished to the highest standard. We believe passionately in offering independently tested and certified products. Wherever possible we have our products certified to European, UK or US standards. This is something that really sets us apart from many other suppliers around the world. We will also only test and certify our products with widely respected institutions such as ECBS, VDS and LPCB. Burton Safes play an active part in the European safe industry, including the promotion of good quality standards and ethical trading. We are proud to be founder members of Eurosafe UK, a trade body that encourages the maintenance of high test standards and good practice. In addition we are active members of the influential European safe makers association ESSA, the UK Master Locksmiths association, and the UK Police run initiatives Secured by Design and Raid Control. We also an ISO certificate from UKAS accredited BRE.